Transferred to the Hayes Dabernig partnership after finishing fifth in the Group I Tatts Tiara earlier this year, Jessy Belle was having her first attempt at 2000 metres and came with a withering run for Craig Williams to win by half a length. Backing up from Melbourne Cup day when she finished fourth over 1700 metres, Jessy Belle produced the best run of her career. Co-trainer Tom Dabernig said the Lindsay Park team was mindful Jessy Belle was on trial at the trip when issuing final instructions to jockey Craig Williams. "I made sure I got up and caught him (Williams) before he walked out and I said, you've just got to ride this dead cold otherwise she'll get trucking and not finish," said Dabernig. "She was going to go for a spell after Cup day and we decided to see how she goes. "Maybe the quick back-up helped just getting her to relax and taking the winkers off (helped)." Dabernig feels the Matriarch Stakes success could create further options for Jessy Belle in the future. "We're going into new territory and she might have been short of her best trip in hindsight," Dabernig said. "Maybe now (riding her) cold and no headgear seemed to work. "It might be another avenue to definitely look at in the autumn." 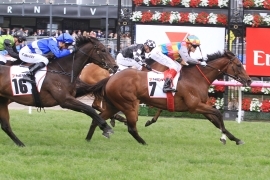 Bred by Bennelong Bloodstock and consigned for sale by Torryburn, Jessy Belle has won eight of 42 starts earning over $760,000 for her big group of owners and is the best of three winners from well-bred metropolitan winner Unconditional Love, a daughter of dual Group I winner Flitter. Unconditional Love has foaled this spring for Bennelong Bloodstock producing a filly by Sebring. Jessy Belle is the 114th stakes-winner for Rock of Gibraltar (IRE), who shuttled to Coolmore Australia earlier his career and remains on the roster in Ireland.